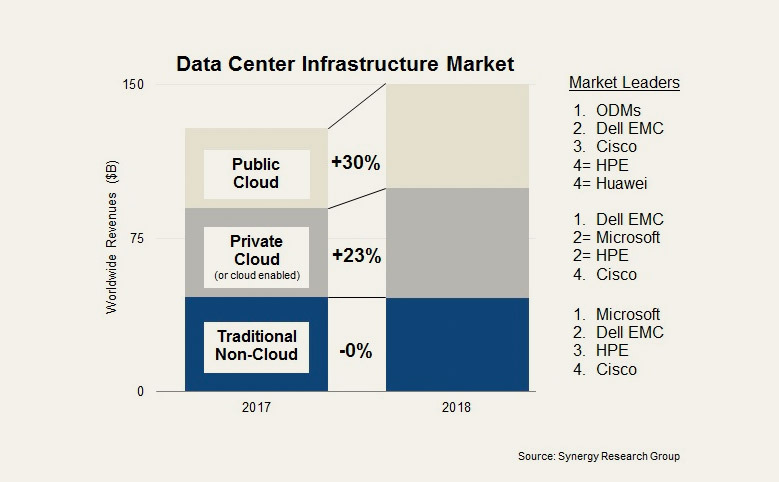 Global spend on data center hardware and software grew by 17% in 2018 with total infrastructure equipment revenues reaching $150 billion, according to new data released by Synergy Research Group. The report also states that the public cloud infrastructure accounted for well over a third of the total revenues. From the report: "The growth was driven by burgeoning demand for public cloud services and by a requirement for ever-richer server configurations, which drove up enterprise server average selling prices. Spending on public cloud infrastructure grew by 30%, while spending on enterprise data center infrastructure grew by 13%, the latter driven by 23% growth in private cloud or cloud-enabled infrastructure, which helped to offset a marginal decline in traditional, non-cloud infrastructure." Local Time: Tuesday, April 23, 2019 07:38 AM PDT – Page Load: 0.2363 Sec.